Both Robbie Allison and Krista Allison Sheinfeld have felt the absence of their father, Davey, at different points in their lives. In each instance, their grandfather, NASCAR Hall of Famer Bobby Allison, has helped fill the void. Robbie was two weeks shy of his second birthday and Krista was 3 years old when their father was killed following a tragic helicopter crash in 1993. In the 25 years since, both have been close to their grandparents, with Bobby often at the center of important moments. Krista said she realized her dad wasn’t there when daddy-daughter dances came around in her early teens. But his absence struck her anew on her wedding day. Robbie expressed similar sentiments about missing his father more as he has gotten older. “You’re not grieving when you’re a child, because you don’t remember your dad, and so everything seems normal until you get older and you start to understand the loss,” he said. For Robbie, reaching out purposefully for a visceral connection to his father wound up building a deeper relationship with his grandfather. 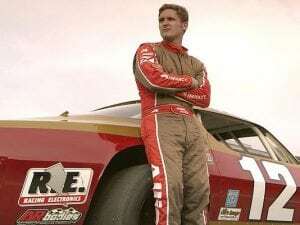 “I definitely think part of me pursuing racing was to achieve a little bit deeper of a relationship with my dad, and to be honest, I think a lot of it was just to see what it was like,” Robbie said. Robbie got into racing late models, earning two wins at Anderson Motor Speedway in South Carolina. That time gave him chances to learn more about Davey from Bobby.